Mobbed! A new book by Janice Harper. Animals have a lot to teach us about bullying behaviors. Perhaps one reason it has been so difficult to change aggressive behaviors is because by focusing on the individual “bully,” we lose sight of the power of group psychology to cause otherwise kind and humane people to act cruelly and inhumanely. This phenomenon of group aggression is most easily provoked, and the most powerful, when someone in leadership makes it clear that they want someone out. When that happens, subordinates rapidly respond to the call for assistance in eliminating the unwanted worker, student, or friend. 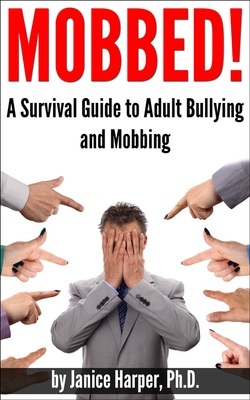 In her new ebook, Mobbed! Surviving Adult Bullying and Mobbing, Janice Harper explores the phenomenon of group aggression and offers a number of strategies for self-preservation. Mobbed! takes a close look at animal behavior to show how much of the aggression we witness in social settings is innate, patterned and predictable. If it is innate, then, can it be stopped? She would argue that no, it cannot be stopped altogether, but it can be prevented, or at least controlled. Primate research has demonstrated the multitude of ways in which the bullying behavior of a high-status member can turn otherwise peaceful group members into a gang of thugs. By failing to gain or show respect a primate can become a target. Rather than assist their friend who was under attack, however the targets friends will pursue and attacked him. This same pattern of harassment is found in wolves who will routinely single out weakened members of their own group for prolonged harassment, almost always instigated by an alpha wolf and carried out with the frenzied compliance of lower-ranking wolves. To stop the harassment, the victimized wolf must show signs of submission—by lying on its back, exposing its throat, belly and groin to the alphas—or by fleeing. For more on just what it means to show submission or flee in the workplace or community, take a look at Mobbed! It’s available on Kindle, but if you don’t have a Kindle, you can download a free reader app on the Amazon site that will allow you to read any Kindle book. Janice Harper, Ph.D., is a cultural anthropologist specializing in conflict and organizational cultures. Her work has spanned a range of social problems, including health, environment and human rights. She is the author and editor of a number of scholarly books and articles, and is a regular contributor to The Huffington Post. Dr. Harper is currently working on a book on workplace mobbing, Murder of Crows: From Bullying to Bloodlust in the Workplace. She can be reached at www.janice-harper.com or info@janice-harper.com. First, understand that there is little the worker can do to stop the mobbing, once it ensues. Second, understand that if a person in a position of leadership in an organization takes aim against a worker, coworkers will one by one unite with management, but most will initially do so in secret. Third, understand that the attacks probably have no merit. Fourth, the people closest to the worker in terms of friendship, work responsibilities, or gender, age or race if an issue of discrimination is at hand, will inevitably turn against them. Fifth, gossip will rapidly shift from what management is doing to the worker, to what the worker is doing to management.